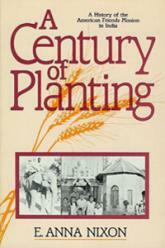 A Century of Planting tells the story of the ministry of the Evangelical Friends Church--Eastern Region in India. It is a testimony of the promise of God to the people who live there and the missionaries who have worked together in the planting and harvesting of the gospel of Christ. E. Anna Nixon author page.